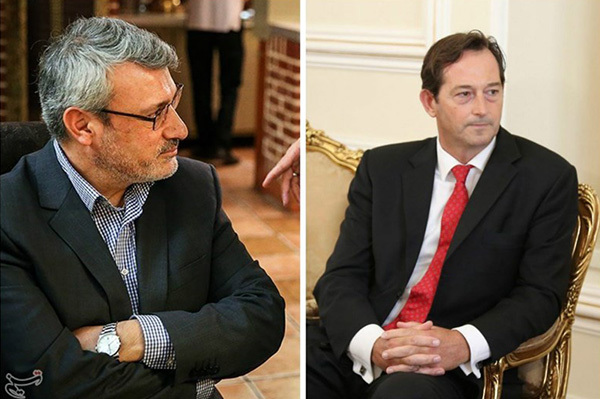 Iran and Britain named their new ambassadors to London and Tehran, as the two incoming officials held a gathering with Iranian Foreign Minister Mohammad Javad Zarif on Monday. Iran has appointed Hamid Baeedinejad, former director general for political and international affairs at Iran’s foreign ministry, as the new ambassador to London. Mr. Baeedinejad was a member of the Iranian team of negotiators in around two years of nuclear talks with the Group 5+1 (Russia, China, the US, Britain, France and Germany). Britain has also named Nicholas Hopton as its new ambassador to Tehran. Mr. Hopton used to serve as Britain’s chargé d’affaires to the Islamic Republic of Iran. He was an ambassador to Qatar from 2013 to 2015. Baeedinejad and Hopton met simultaneously with Foreign Minister Zarif on Monday. An informed official at Iran’s Foreign Ministry announced that the two countries reopened their embassies more than a year ago, and that chargés d’affaires were handling the whole issues in the meantime. With the conditions being ready for an upgrade in the diplomatic ties, Tehran and London decided to appoint ambassadors, the official added, but emphasized that such an upgrade would not translate into settlement of the whole problems. “The Islamic Republic will continue to explicitly express its views in a bilateral manner, and so on,” the official added. Following the incident, Britain withdrew its diplomatic staff from Tehran on November 30 and asked Iran’s diplomatic delegation in London to leave within 48 hours. The two countries made diplomatic efforts afterwards to amend ties. In August 2015, the British embassy in Iran reopened after a 4-year closure. Britain’s Foreign Secretary Hammond attended a ceremony in Tehran to mark the reopening on August 23. It was the first visit by a British foreign secretary to Iran since 2003.